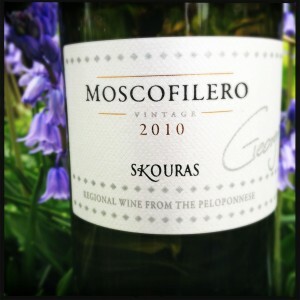 Skouras Winery was created in 1986 by George Skouras who studied oenology in Dijon, France. 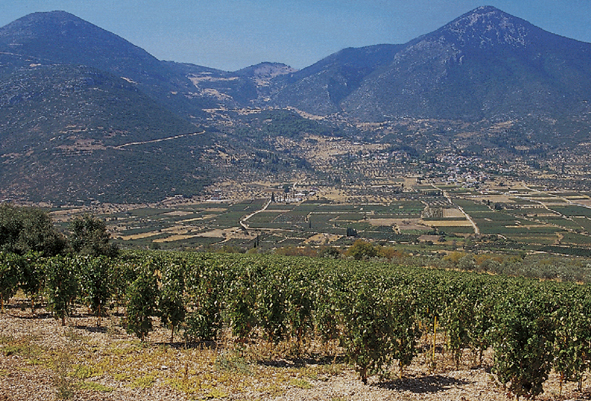 The founding winery is located in Pyrgela, Argo with a second winery built in 1996 at Ghymno, Nemea, and in 2004 operations moved to a new winery in Malandreni. Skouras Winery produces wine made from both indigenous and international varietals sourced from estate vineyards and regional growers. Both of these wines are good value for the money but I must lean towards recommending the white Moscofilero. I cannot recall the last time I drank a Greek white wine so I had absolutely no idea what to expect when I poured myself a glass. It is a lovely wine with good white fruit, floral notes, and pleasing mouthfeel. The Moscofilero grape has a pink colored skin and is known to produce wines with a strong aroma of roses. It grows particularly well in the high-altitude vineyards of Mantinia where the fruit is harvested in October. If you want to try a new type of white wine then pick up a bottle for the weekend. Many thanks to John for recommending this wine. Both of these selections are currently available at MacArthur Beverages. 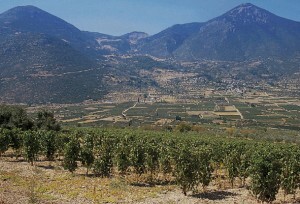 Vineyard in Nemea, Image from Skouras Winery. Imported by Diamond Importers. This wine is 100% Moscofilero sourced from the Mantinia vineyard located on sandy soils at 750 meters. The vines are 25 years old. Half of the free-run juice is used due to the skin color which is then fermented in stainless steel followed by short aging on the lees. Drunk over several nights this wine has a nose of lightly ripe white fruit and peaches. The mouth follows the nose with white fruit that is backed by stone flavors then turns a bit tart as it takes on a suppleness which is balanced by acidity. There are floral white fruits in the finish. Imported by Diamond Importers. 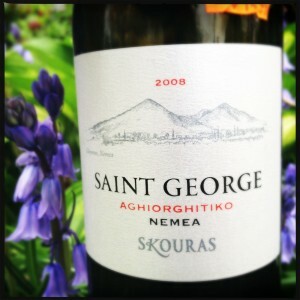 This wine is 100% Aghiorghitiko (Saint George) sourced from vineyards on clay soils at 650 meters. The vines are 24 years old. The fruit is fermented in stainless steel, undergoes malolactic fermentation in barriques, then is aged for 12 months in used French barriques. Drunk over two nights there is a lightly scented nose of berries. In the mouth the fruit is bluer, with hints of red tart fruit. There is a softness to the flavors as acidity causes salivation on the sides of the tongue. The finish reveals a gentle ripeness, spice with a slight perfume in the soft aftertaste.